Marconi Tile of Westfield Massachusetts installs ceramic, marble and granite tile for home owners and contractors. Our clients consist of residential, "high-end" residential and commercial jobs. Our craftsman are experienced in all areas of tile and stone installation, including mud jobs, custom stone installations and any removal and preparation work that may be needed. We tile in any area of your house, including kitchen floors, back splashes, bathroom walls, ceilings, floors, sunrooms, family rooms and basements. Marconi Tile of Westfield Massachusetts installs ceramic, marble and granite tile for home owners and contractors. Our clients consist of residential, "high-end" residential and commercial jobs. Our craftsman are experienced in all areas of tile and stone installation, including mud jobs, custom stone installations and any removal and preparation work that may be needed. We tile in any area of your house, including kitchen floors, back splashes, bathroom walls, ceilings, floors, sunrooms, family rooms and basements. 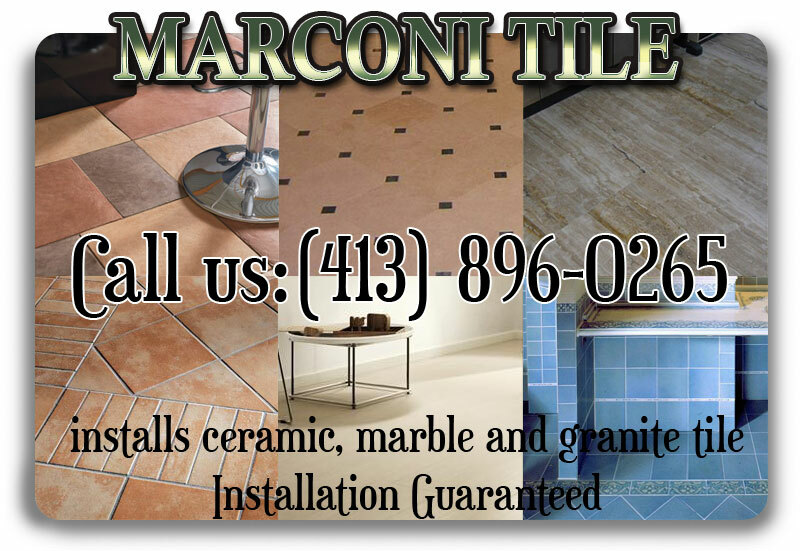 Marconi Tile renovates bathrooms, installs granite counters and hardwood floors.